Laparoscopic Gastrectomy with D2 Lymphadectomy for Gastric Cancer: Is It Still Time-consuming? Introduction: Although laparoscopic technique provided a minimally invasive approach for gastric cancer in the past ten years, most surgeons still thought that laparoscopic gastrectomy with D2 lymphadectomy was time-consuming. 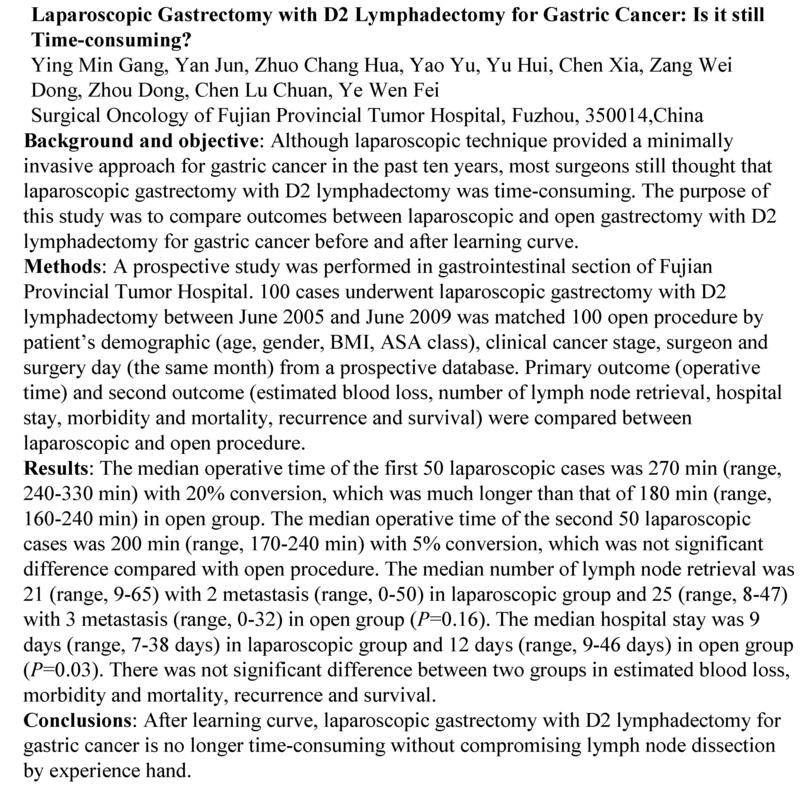 The purpose of this study was to compare laparoscopic and open gastrectomy with D2 lymphadectomy for gastric cancer before and after learning curve. Methods: A case-matched study was performed in gastrointestinal section of Fujian Provincial Tumor Hospital. 100 cases underwent laparoscopic gastrectomy with D2 lymphadectomy between June 2005 and June 2009 was matched 100 open procedure by patient’s demographic (age, gender, BMI, ASA class), clinical cancer stage, surgeon and surgery day (the same month) from a prospective database. Primary outcome (operative time) and second outcome (estimated blood loss, number of lymph node retrieval, hospital stay, morbidity and mortality, recurrence and survival) were compared between laparoscopic and open procedure. Results: The median operative time of the first 50 laparoscopic cases was 270 min (range, 240-330 min) with 20% conversion, which was much longer than that of 180 min (range, 160-240 min) in open group. The median operative time of the second 50 laparoscopic cases was 200 min (range, 170-240 min) with 5% conversion, which was not significant difference compared with open procedure. The median number of lymph node retrieval was 21 (range, 9-65) with 2 metastasis (range, 0-50) in laparoscopic group and 25 (range, 8-47) with 3 metastasis (range, 0-32) in open group (P=0.16). The median hospital stay was 9 days (range, 7-38 days) in laparoscopic group and 12 days (range, 9-46 days) in open group (P=0.03). There was not significant difference between two groups in estimated blood loss, morbidity and mortality, recurrence and survival. Conclusions: After learning curve, laparoscopic gastrectomy with D2 lymphadectomy for gastric cancer is no longer time-consuming without compromising lymph node dissection by experience hand. Key words: Laparoscopy; Gastrectomy: D2 Lymphadectomy; Gastric Cancer.